and has been a great performer! Replaced One deck belt, One Deka battery, 2 sets of mulching blades, and one idler pulley for the blade deck. Other than that, Yearly oil changes, yearly gas filter changes, and I remove the deck to clean, sharpen & balance blades, and grease Zerk fittings on shaft towers every 5th mowing. Here are some pics from May 2009. I have the same one built in 1996. I also live in Pottstown. 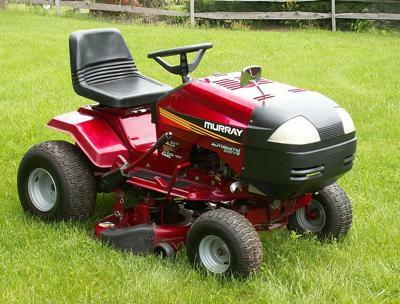 I need to adjust the mowing height and don't have the Manual. Can you help? My mom gave my Dad's Murray (same as yours) to me after he died. After about thirteen years of use I retired it for a Ariens ZTR. I am currently rebuilding the engine and plan on restoring it to as near as new condition as I can. Yours looks as good as new from the pictures. Some may say it isn't worth restoring, but it is more for sentimental reasons. I was really amazed at the build quality of the Briggs and Stratton engine when I tore it down. Join in and write your own page! It's easy to do. How? Simply click here to return to riding lawn mowers to approve.